Of lads and lasses, sticky floors and shots galore, and the early morning taxi home, all under the watchful eyes of the Bouncers. 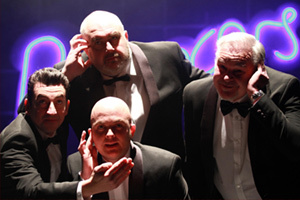 Written by the multi award winning John Godber, this modern classic will see the boys catapulted into the 21st century! With contemporary music and an updated script to boot, this one’s worth getting dressed up for!